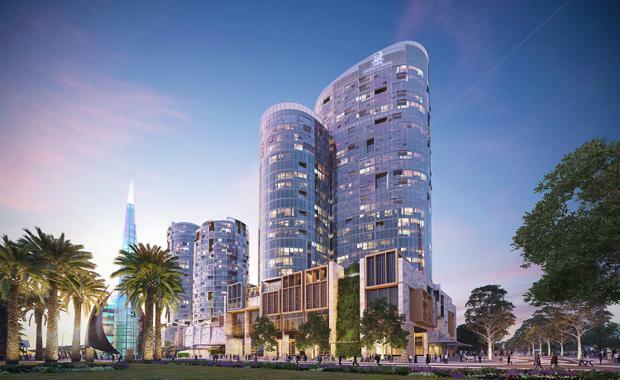 Far East Consortium's plans for two $398 million luxury apartment towers at Elizabeth Quay in Perth have been given the official stamp of approval. West Australian Planning Minister John Day has given Far East Consortium development approval to the 379-apartment complex, seven months after the plans were originally submitted. Elizabeth Quay. Image: Scharp. [/caption]Elizabeth Quay is the centrepiece of a Government plan to revitalise the city and deliver better connectivity to the Swan River. Located between Barrack Street and William Street, Elizabeth Quay will feature inlet connected by 1.5km of boardwalks and promenades, numerous public spaces; a new hotel and short stay accommodation and contemporary inner city living opportunities. At the heart of Elizabeth Quay, Ritz-Carlton is to open a luxury hotel in 2018, the first company hotel in Australia for 17 years. The 204-room Ritz Carlton, Perth, will also include 379 luxury one, two and three bedroom apartments in two towers adjacent to the Bell Tower. Elizabeth Quay. Image:Scharp[/caption]Cottee Parker Architects has designed the development, which will be built on reclaimed land, on difficult foundations and in an environment open to strong winds and a harsh environment. Cottee Parker Architects Director Rob Cottee said the firm had strived to create buildings that complemented the surrounding environment and were inspired by Western Australia. “We’ve taken into consideration all the climactic elements – we’ve used those to try and shape the building so down low the whole building, across two sites, unfolds as a series of cellular, labyrinth like forms that are built up almost like a termite mound or something that is a natural occurrence," he said. Elizabeth Quay. Image: Scharp[/caption]“Then we’ve assumed the natural elements and how they might erode that form so down at the lower levels you’ve got the tidal influences and the water rushing in and eroding so its quite sort of jagged and it exposes the inner cells and as you get higher you’ve got the forces of wind in particular and rain and so the upper components are more rounded and smooth to ameliorate the wind conditions. “I think it’s likely to be a discussion point among the people of Perth for a long time to come and I think that’s a good thing."